With pretty similar names, a Garmin Vivofit and Vivosmart could be easily confused. If you’re looking to buy a wearable fitness tracker, make sure you understand how these products differ before you buy. 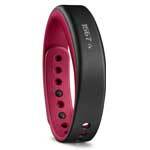 Note: Looking for the Vivofit 2? Though this post was written for the original Vivofit release, all the below still applies for the new version. I’ve covered the new features for the Vivofit 2 separately. First up, one of the key features are vibration alerts. 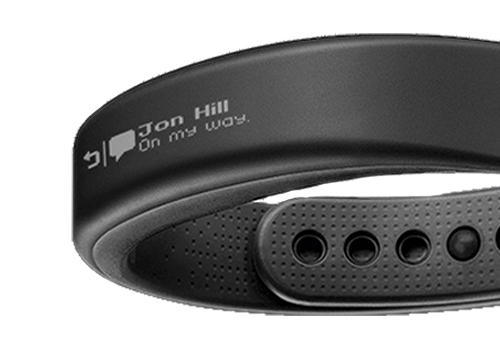 When wearing the device you’ll feel it vibrate on your wrist when you get a notification. For instance when inactive for over an hour, the Vivofit can give you a nudge to get off the sofa and onto your feet. It’s an effective way to get your attention and is similar to what we’ve seen in other leading activity trackers like the Jawbone UP24. This one is a biggie. When hooked up to your smartphone, the Vivosmart will display mobile notifications as they happen. 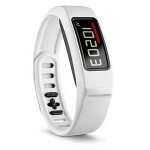 You’ll be alerted of emails, calls and messages from a vibration on the wrist. It saves you having to get your phone out of your gym bag, as you can just have a quick glance to see if its important. Worried that messages on your wrist will be readable by everyone? At least with a smartphone you have some privacy around accessing your messages. To combat this fear, the Garmin Vivosmart has a privacy setting which when switched on, will notify that you have a message, but will not display the content on your wrist. To use any of these smart notification features on the Vivosmart, you need to check if your phone is compatible. Mainly for iOS and Android smartphones, you can select which notification types pull through to your Garmin wearable. After you’ve glanced at that text message on the Vivosmart display, the touchscreen allows you to just swipe it away. To preserve battery life, your activity tracking stats are hidden on the OLED display when not interacting. To awaken the screen just give it a double tap. With no touchscreen in the Vivofit, its a pretty significant difference between the two Garmin wearables. Wearable review – What features are on the Garmin Vivofit? So you’re working out hard to your music on shuffle mode, and then some inappropriate song starts playing. The Vivosmart has the added feature of being able to skip tracks. No memory to add tracks onto the device itself, rather the wearable plays tracks from your phone. It’s good to know you can quickly skip without having to get your phone out of your pocket. Should you ever misplace your phone, the Vivosmart can use Bluetooth connectivity to help you in the right direction. It’s a bit of a hot and cold game as the bars on the display increase as you get warmer to your lost mobile device. Your phone will also make alert sounds to give further clues. Useful if the phone is within 20 metres of you, for instance, in your bedroom and you’re looking in the kitchen. Because Bluetooth is only over close range, the Vivosmart won’t find your phone if you’ve left it on the bus and you’re at the gym. To prevent the above scenario from ever happening, Abandoned Phone Alert simply vibrates on your wrist once you’re Vivosmart and mobile are nearly out of range. You’ll be thankful it reminded you! Heard about the Virb? It’s a Garmin made video camera you can wear or mount to your sporting equipment and record in Full HD (1080p). Wirelessly connect a Virb camera up to a Vivosmart over ANT+ and you can control the camera directly from your wrist. Not only can you start and stop recording, you can even take a cheeky photo too. It’s pretty useful if you’re cycling or skiing, and the camera is mounted either on the bike or on a helmet that’s difficult to reach whilst still moving. While both the Vivofit and Vivosmart offer sleep tracking, its the Vivosmart which offers the basics of an alarm clock. With that new fancy vibration setting you can be woken up quietly without disturbing anyone you may share a bed with. You can alarms to vibrate at different frequencies too; as a one off, daily, or on weekdays. OK, both devices are pretty light anyway, but incase you were wondering the original Vivofit weighed in at 25 grams. With the new leaner Vivosmart models the large is 19 grams and the smaller model being 18.7 grams. That’s some impressive weight loss which even when attaching the Vivokeeper black clasp (1.4 grams), you’re still lighter with the Vivosmart. With all that extra mobile connectivity inside, the Garmin Vivosmart naturally uses more power which comes at a cost to battery life. You’ll typically get up to 7 days use out of its rechargeable lithium battery before the need to plug it in. Vivofit on the other hand uses two replaceable CR1632 coin cells, sort of like watch batteries which can be replaced yearly. It should be said that a 7 day battery life is still quite good in comparison to many of the new Android Wear and Apple Watch devices which will typically need charging every day. The presence of a touchscreen display and deeper mobile integration makes the Vivosmart a good improvement to the Vivofit. As a newer product, the Vivosmart will typically cost you around £30 more, but its totally worth it if you’re going to use any of the 10 differences mentioned above.